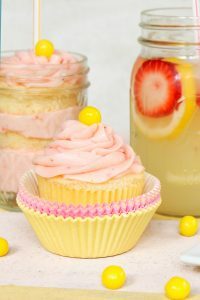 Strawberry Lemonade Cupcakes – moist lemon cupcakes paired with fresh strawberry buttercream for the perfect combination of sour and sweet. A new cupcake recipe by our contributor, Lauren Kapeluck of EllenJay Events. When I think of summer, bright yellow lemons and sipping on a glass of fresh squeezed lemonade come to mind. I am a huge fan of lemons, and really all things sour. As a kid I can remember spending summer days at our local pool and every afternoon I would visit the concession stand to order a frozen lemonade and a box of lemonheads to satisfy my sour cravings. Still to this day I have those same cravings and welcome all things citrus and tangy during the hot summer months! 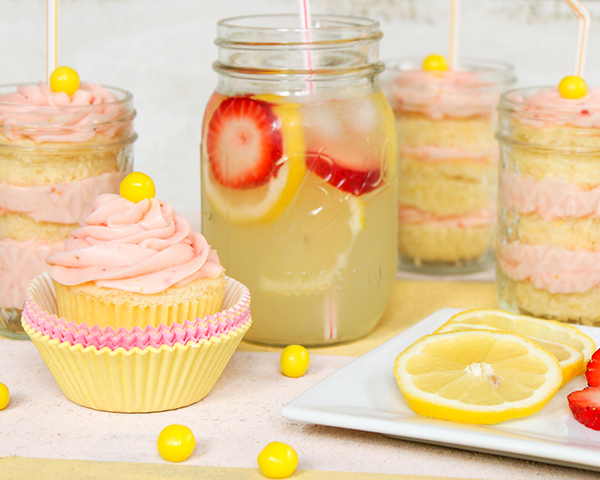 So with lemonade as the inspiration, I have created a Strawberry Lemonade Cupcake that I think you are going to love! 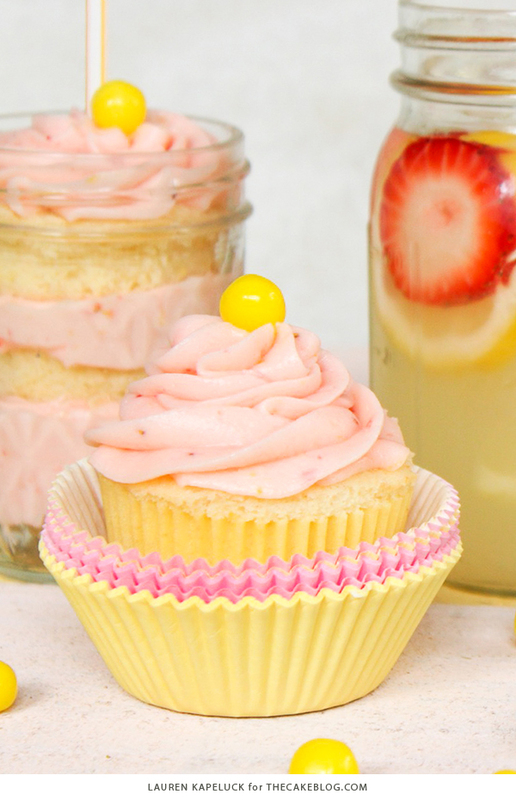 Strawberry Lemonade cupcakes are the perfect combination of both sour and sweet. The moist lemony cake provides a nice tang, while the strawberry buttercream provides a touch of sweetness to balance out the flavors. Not to mention I am loving the yellow and pink color combination of the cake and the icing, so fresh and fun! 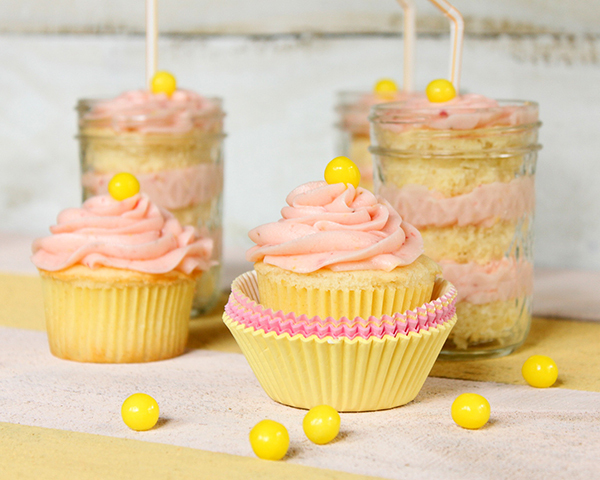 And for extra cuteness, why not display these cupcakes in a jar embellished with a straw to mimic sipping lemonade from a mason jar! These triple layered cupcakes are the perfect portable treats for an afternoon picnic or would make adorable favors at a shower or birthday party. 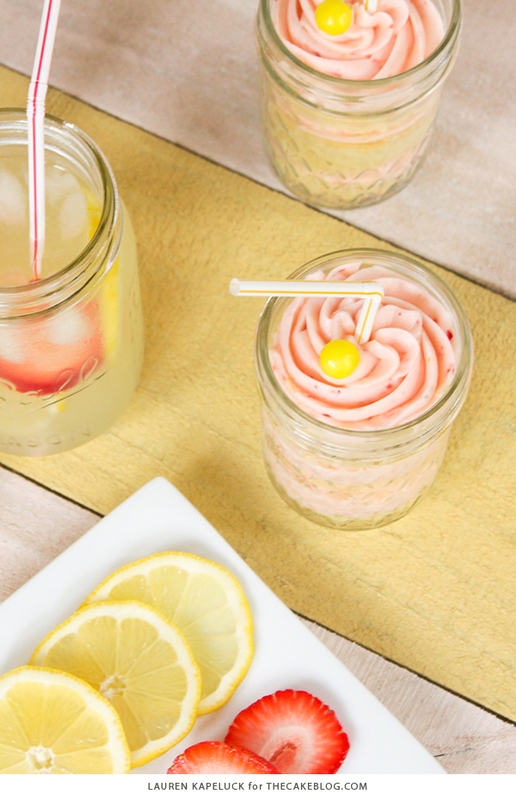 If you don’t want to fuss with assembling these cakes in jars no big deal, they are just as cute served as traditional cupcakes with a swirl of icing and topped with a lemon drop! 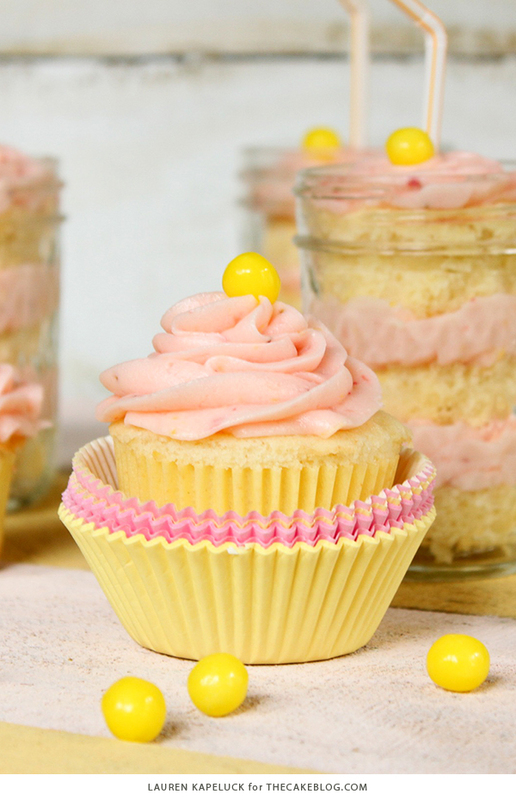 Strawberry Lemonade Cupcakes – moist lemon cupcakes paired with fresh strawberry buttercream for the perfect combination of sour and sweet. In medium bowl mix together dry ingredients: flour, baking powder, salt, lemonade powder and lemon zest, set aside. In bowl of stand mixer beat the butter and sugar on medium-high using the paddle attachment. Beat until pale and fluffy, about 4 minutes. Add eggs, one at a time beating well after each addition and scraping down sides of bowl as needed. Gradually add the dry ingredients and milk, alternating starting and ending with the dry ingredients and mix until combined. In bowl of stand mixer, beat butter for 1-2 minutes using the paddle attachment. 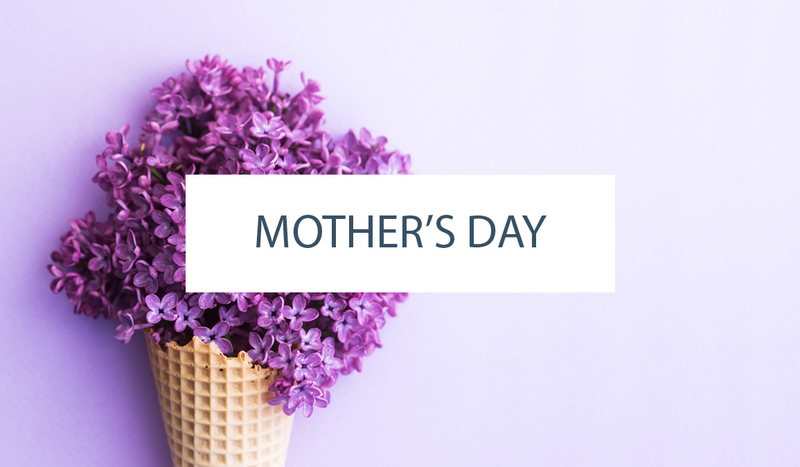 Gradually add confectioners’ sugar and continue mixing scraping down sides of bowl as needed. Mix in strawberry puree and lemon zest. Place the icing in a piping bag fitted with open star piping tip to decorate the cooled cupcakes. Slice cupcake in half with serrated knife. You will need one and a half cupcakes (3 pieces) for each jar. Place half a cupcake in the bottom of the jar and add a dollop of icing on top. Repeat two more times with cake and icing. Garnish with a lemonhead on top. For extra cuteness add a plastic straw. OH MY! These look amazing! Can’t wait to try them out! The mason jars are such a great idea! Too cute! Mmmmm…..YUM! You did a fantastic job. These look delicious!!! I can not wait to make these. They look so good. Yum! I may have to re-think the cupcakes for my son’s upcoming party. Any idea how long the frosting will hold up in the heat? Can’t wait to try these! Ive seen other strawberry or pink lemonade cupcakes but they were all box mix and Id like to do from scratch! Perfect! Love this idea!! The mason jars are way too cute. These are really inspirational- a fantastic summery cupcake! So excited to make these. My kids have been setting up their lemonade stand every other day. What a fun idea to add these to their stand. Hey Ladies – Thanks for all the super sweet comments about these cupcakes! Zoila: As far as the frosting holding up in the heat, I would try to keep them inside in the air conditioning up until right before serving. I live in hot and humid Mobile, AL and the icing did fine for me inside and kept its shape for several days. I never tried to take them outside though. 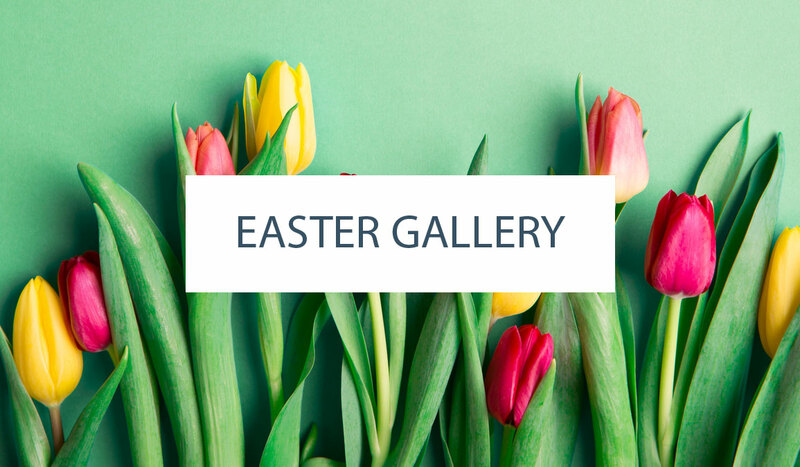 I hope you enjoy them! 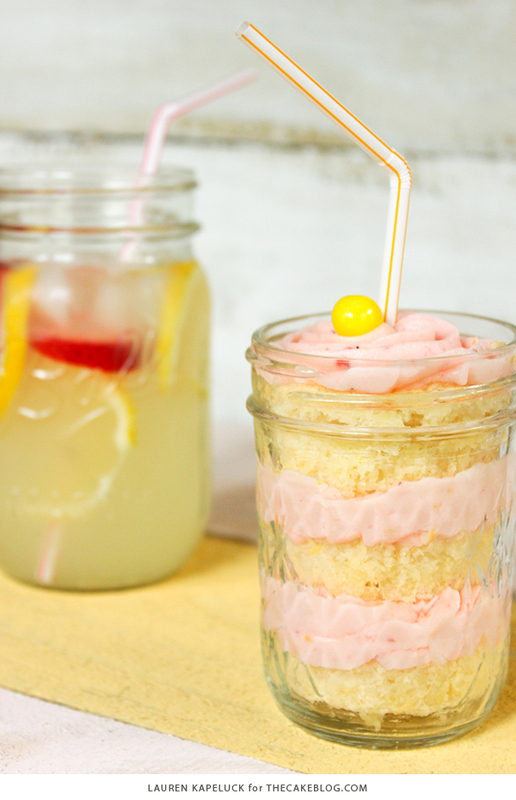 I also love the lemonade in the mason jar with slices of strawberry and lemon. Too cute. May have to try that for my daughter’s butterfly garden party coming up next month. 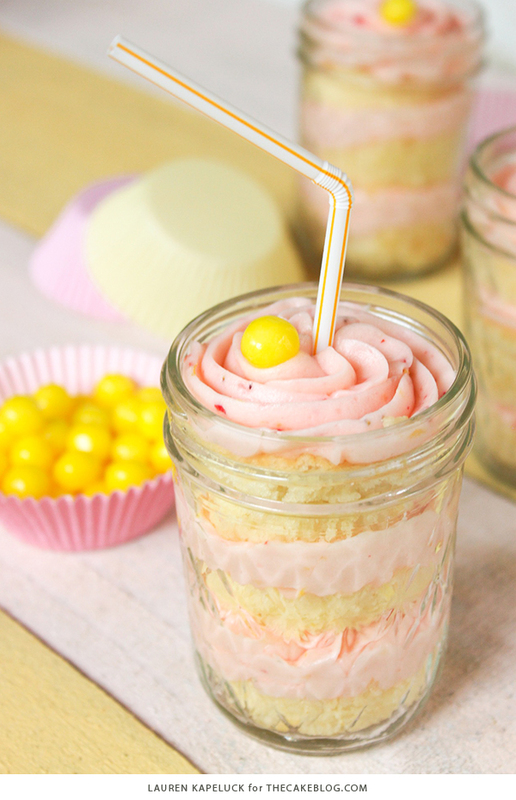 These look delicious…the food styling and photography is so beautiful too, I love the mason jars. Thank you for the lovely idea! I was in a time pinch so I made miniature cupcakes with a boxed lemon mix and topped them your strawberry frosting. Added a bit more powdered sugar to get it the stiff consistency I like and for it to better hold up during transport in the Texas heat. Topped with lemon peel curls. Turned out adorable and very yummy! Nice pictures and thanks for the recipe. Thank you for this recipe! Made the cupcakes last night for my son’s party this weekend. They taste great, just a hint of lemon without being too tangy. These are sure to be a hit. how far in advanced could I make these, if I Keep them in the fridge? Although I have not tried to make them in advance and refrigerate, I would say a day ahead of time would be fine. Or you could make the cupcakes a day early and keep in a tupperware container until you are ready to assemble and ice them. Hope this helps! I’ve made these as cupcakes many times and loved them. I made these today! They were really yummy but very very rich. Next time I won’t use as much butter. Otherwise everything worked out perfectly. I’ll probably use more lemonaide mix and lemon zest for fun! Love this recipe, it sounds incredibly delicious!!!! One question though because I wanna make this for adults……..Could I add vodka to this recipe to make coktail cupcakes? This looks awesome. I like in the UK and don’t get Lemonade powder mix…can i omit it out or will that change the batter? So I made these for a youth party at church yesterday and made a mistake that I didn’t realize til I read the comments on this post. I didn’t have any country time lemonade but I had “Koolaide” lemonade mix. I initially thought it was pretty much an even exchange. Didn’t have enough for an even exchange so substituted it by half and got the most wonderful lemon cupcakes ever! The cupcakes were quite tart, not too tart but nice and lemony. After reading other comments of “hint of lemon” I new immediately I had made a mistake 🙂 However, it was a glorious one. Thank you for this fabulous recipe! It is a keeper! They were so moist and perfectly dense. I thought I had died and gone to heaven!